Day two of our trip began with some organised sightseeing in Ashgabat. The city has a rather unique appearance, as most of it has been built using a radically reduced colour palette centered around white, green, and gold. All buildings have been clad in marble, and everything is spotlessly clean. Some of the architecture is particularly interesting, not least the Palace of Happiness where newly-wed couples can have their picture taken in front of a large picture of the president. There are occasional billboards, but they don't show advertising; instead they all run the same video loop that is probably best described as a showreel for tourists. The footage included close-up shots of the roller coaster at Ashgabat Recreation Park, and thus gained our unqualified approval. Our guide was able to tell us a whole range of interesting facts about Turkmenistan, which has a number of laws that are quite unusual for those used to more liberal societies. We particularly liked the one banning smoking outdoors, which is apparently having the desired effect as the country now has the lowest rate of tobacco use in the world. Another rule outlaws black cars; those who owned impacted vehicles when the law took effect were required to have them resprayed at their own cost. Dirty cars are forbidden in the capital; after a rainstorm there is a ten hour grace period for owners to clean them before they are at risk of being stopped by the authorities. The Alem Entertainment Center is home to what is described as the world's largest indoor Ferris wheel, a fifty-metre diameter machine enclosed in a white and gold exoskeleton. The ride looks quite dramatic, though it's clearly a triumph of form over function, as the view from on board is limited to what can be seen through star-shaped openings on each side. The Monument to the Constitution is visible to the east, but that's essentially it; the west has nothing but trees and empty desert. The cars are fully sealed with tinted glass, negating any potential for photography, though on the plus side the on-board air conditioning does at least allow a few minutes of respite from the heat. Lonely Planet states that only the insane or deeply unfortunate find themselves in Ashgabat in July and August, and it's probably best to just say "guilty as charged" at this point. General access to the facility is via an entrance at the rear. Our guide told us that the main door is only for use by one person in the country, and though she didn't specify who it doesn't require all that much imagination. The foyer is decorated with an enormous print of President Gurbanguly Berdimuhamedow surrounded by happy children, in a style very reminiscent of the artwork seen during my trip to the Democratic People's Republic of Korea back in 2011. The picture was apparently taken during the official opening ceremony for the wheel; one of the children holds the certificate from Guinness World Records. The ground floor of the building contains a selection of family-sized amusement rides, including a carousel, tea cups, bumper cars, and a plane ride with the Emblem of Turkmenistan embossed on each vehicle. These are accompanied by a number of arcade machines with localised faceplates, including Harley Dewidson Motoulagy and Terminatordan Halas Bolmak, as well as half a dozen different target shooting games. One of our group enjoyed several minutes of concentrated sniping on a Pan Amusements' Hillbilly, and managed to attract a number of curious observers before his game came to an end. The Berkarar shopping mall is the largest facility of its type in Turkmenistan. 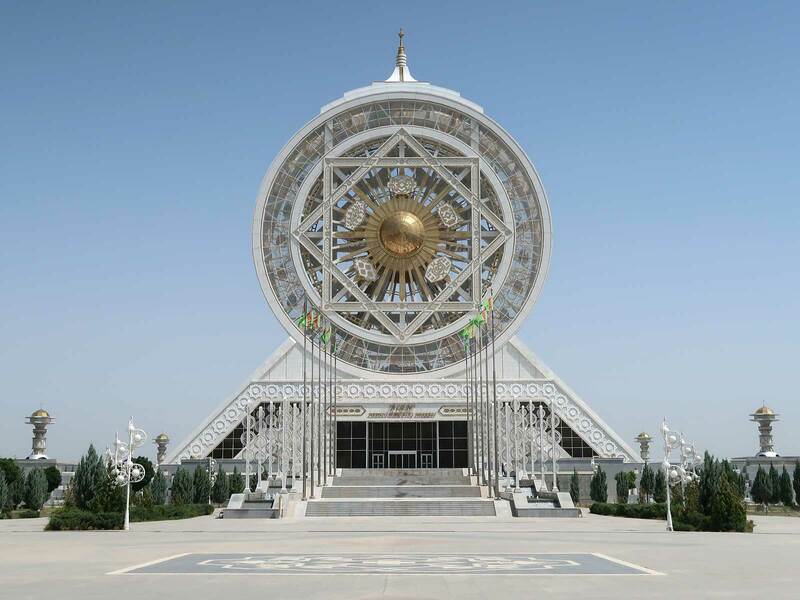 The exterior resembles every other building in Ashgabat, blending glass with the obligatory white marble and gold trimming. The interior on the other hand feels like something designed in the United Arab Emirates, with an elaborate central courtyard, a gold plated monument around a water feature, bright lighting, and intricately patterned floors that are spit-shined to perfection on a regular basis. I only spotted local brands across the four levels of shops, though it's probably worth bearing in mind that I'm not exactly a connoisseur of international fashion. Children's World can be found on the top floor of the building. Most of the space is devoted to arcade machines, though there are four family rides too; bumper cars, a miami, a carousel, and Egypt Coaster (#2456), a figure eight spinning coaster of the type now found all over the world. The track supports had hydraulic dampers on them, presumably to protect the building from vibrations, and these may perhaps explain why the ride was one of the smoother examples of the genre. We went for two cycles, each of which comprised five laps with a decent amount of spinning. Readers retracing our steps should bear in mind that this coaster generally only operates in the evenings. Your tour company should be able to check the latest information for you. Ashgabat Recreation Park is a large urban garden that dates back to the late nineteenth century. 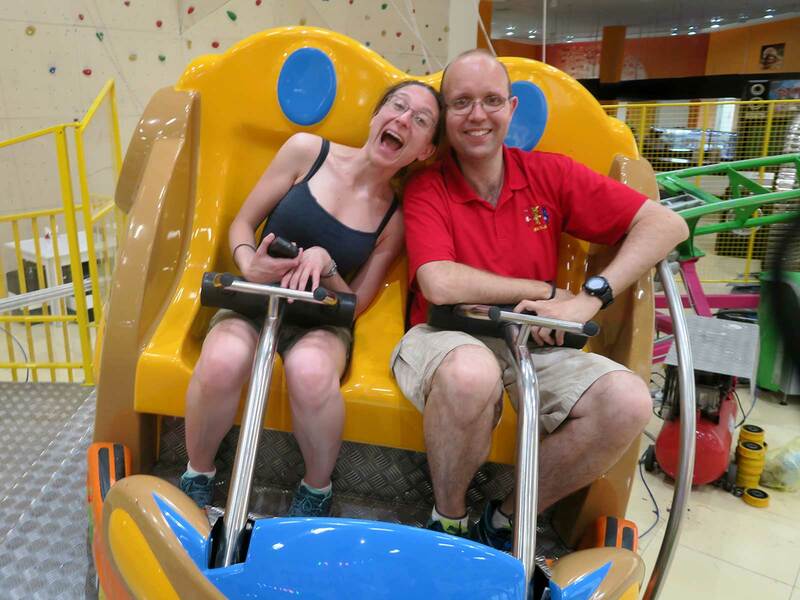 It was renovated and rebuilt in 2014, and as part of that project the authorities decided to install a package of amusement rides from Italian manufacturer SBF Rides. Several of the flat rides were wrapped up in protective sheeting today, but fortunately the roller coaster was fully operational. There was only one catch; for whatever reason the powers that be had decided that a standard layout double coaster was limited to children aged between four and eight years. Our intrepid guide came to our rescue, chatting first to the operator on duty and then obtaining details for a member of management, who she brought us to see. The conversation when it happened was quick enough, and successful; apparently the fact that we were foreigners was enough to gain us special dispensation to experience Tomzak Otly (#2457) for ourselves. We were asked to sit two in front, two in the middle, and two in the back, presumably to balance the train properly, and in due course we were dispatched for four enjoyable laps.